Korea University will provide you Free Shuttle Bus from Incheon Airport to the ISC housing for your convenience. The assistants wearing the KU ISC t-shirts will meet you at the airport. They will guide you to the right bus. The bus will leave right on time and seats will be filled by first come and served. Most of international airlines offer flights to Incheon International Airport, newly established in April 1, 2001. From the airport it is approximately a KRW 70,000 Won taxi fare to Korea University. The fare of regular taxi starts from KRW 3,000 Won, as opposed to the black deluxe cab that starts at 4,500 Won. Since Korea University is a well-known private institution, most taxi drivers know where it is. It takes about 1.5 hours. Bus No. 6101 for Surak Terminal can be caught at bus stops 3B and 10A on the first floor of Inchon International Airport. Get off at Sungrye Elementary School (Korea University) and walk five minutes toward the Korea University subway station. You can get on the Airport Railroad Express toward Seoul Station(서울역) and get off at Gongdeok Station (공덕) which will take around 55 minutes. 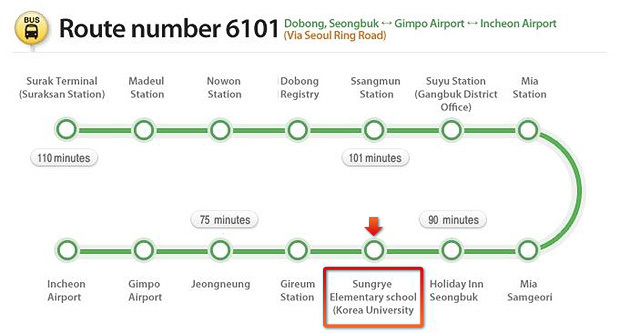 Here you transfer to line number 6 (brown line) towards Bonghwasan (봉화산). It will take around 25 minutes to arrive at Anam Station (안암). From there you will find ISC staffs anywhere waiting to help you and they will give you a direction to the dormitory. You will find your dormitory after 20-minute walk.